Join fellow CATCH members for this fun social event. You are invited to an evening of networking, learning, and crafting! Meet members of the CATCH community and enjoy remarks from a guest speaker, while sipping seasonal cocktails. If desired, you may also choose to complete an easy DIY project from Revel’s Craft Bar menu! Create, celebrate and be inspired. A one-of-a-kind golf outing in partnership with CATCH, benefiting American Family Children's Hospital. Designed with the participant in mind - affordable entry price and 14 hole round. Have fun for a great cause while meeting new people. Friends of UW Health is excited to announce Hearts and Hands 2019 - a complimentary luncheon to benefit the American Family Children’s Hospital. This event will take place on Tuesday, February 12, 2019 from 11:30 am -1:00 pm at Overture Center for the Arts. This simple and inspiring event includes lunch, a brief program to learn more about the amazing work that takes place every day at the hospital and a gentle appeal for support. We invite you to help make it successful by becoming a table captain. Invite and confirm the attendance of eight people, including you. You are NOT required to pay for you or your guests to attend. It is a wonderful opportunity to bring friends and family together to support your passion. Provide a list of your guests by Tuesday, February 5, 2019. Attend the event with your guest and enjoy! At the conclusion of the program, guests will be asked to consider making a gift to support the work on American Family Children’s Hospital. There is no minimum gift level and any donations are greatly appreciated. If you would like to serve as a table captain, please email your confirmation to Liz Hill at ehill2@uwhealth.org by Friday, January 11, 2019. Upon receipt of your confirmation we will provide you with your table captain materials, including an electronic invitation you can email to your guests and other event details. Take to the ice for a family-friendly adventure as Skate with a Superhero arrives to The Ice Rink at The Edgewater. Join your favorite superheroes as you fly around the outdoor ice rink overlooking Lake Mendota. Kids can collect passport stickers at each interactive station including cookie decorating, crafts and meet more superheroes inside. At CATCH, we strive to teach kids about the importance of giving back. So, one station will feature assembling a craft kit and create cards for patients at American Family Children’s Hospital. Warm up after a round on the ice with hot chocolate and other refreshments. Skate rental $3/person (available in sizes Youth 9 - Adult 13). The event is free to attend, but we ask that each family bring a gift for a patient at American Family Children’s Hospital. Gifts must be store bought, new in the original package and unwrapped. View a list of acceptable and requested donation ideas here (please no stuffed animals, food or latex). Parking at The Edgewater - Special event day parking available for guests in a covered and secure garage at $3/hour. Due to a low clearance in the public parking facility, over-sized vehicles cannot be accommodated. Keep your eyes open for this upcoming family-friendly event. We're collecting toys for the patients at American Family Children's Hospital. No tickets needed. Save the date. This is one event you'll not want to miss. 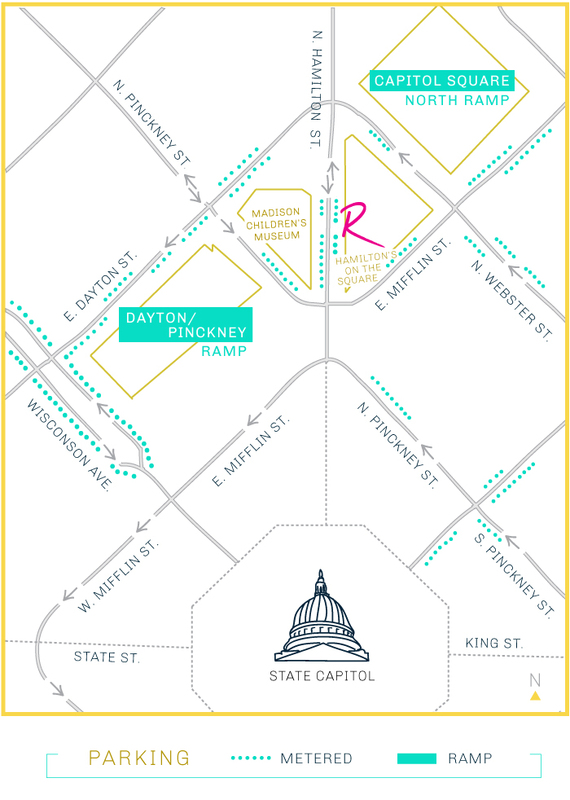 This year's annual CATCH Fall Ball, An Evening Under the Stars will be held at Zendesk, overlooking downtown Madison's Capitol building. Enjoy live music, a silent auction, a prize punch wall and food from Food Fight restaurant, Everly on Monroe Street. Our signature event provides both members and non-members a unique opportunity to come together for a wonderful night out benefiting AFCH. Don't forget to dress in your finest attire (check out Pinterest)! Coordinate a group night out with friends or enjoy date night with your partner. CATCH Member Volunteer Opportunity! We need your help to make this event a success. Please consider signing up for a 30 minute volunteer shift at the event. Whether checking in partygoers at the registration table, heading up the prize wheel or coordinating the silent auction check-out table, all of your time is important and needed. Plus, as a thank you for volunteering, you’ll receive two (2) free drink tickets. Thank you to these wonderful event sponsors. Is your child an aspiring chef or simply loves to get involved in the kitchen? Join us for a fun, hands-on cooking experience where we'll make a variety of healthy & delicious snacks. This private class is hands-on for parent and child. Menu to come. $15 Registration is for 1 parent and 1 child open until noon on October 19th. No age restrictions. Parent or guardian must be present during class. Space is limited to the first 20 children of CATCH members only. Register each child separately. Registration will open to the general public if tickets remain on October 12th. Join fellow CATCH members for this fun social event. You are invited to an evening of networking, learning, and crafting! Meet members of the CATCH community and enjoy remarks from guest speaker Dr. Megan Moreno, principal investigator of the Social Media and Adolescent Health Research Team (SMAHRT), while sipping seasonal cocktails. If desired, you may also choose to complete an easy DIY project from Revel’s Craft Bar menu! Create, celebrate and be inspired. Space for the event is limited so please RSVP today. The $10 registration fee saves your spot and will be applied to any drinks/snacks/craft projects that you purchase at Revel during the event. Cancellations made less than 24 hours in advance of the event and no-shows will forfeit their deposit. There are many convenient downtown parking options less than a block from Revel. Derby day done right! Join us & The Edgewater on The Grand Plaza at The Edgewater for Madison’s 3rd Annual Kentucky Derby Party, sponsored by Maker’s Mark and Stella Artois. And, new this year, benefiting Community Around the Children's Hospital- CATCH. The outdoor event will feature Kentucky-style bluegrass with The Dang-Its followed by Madison favorite, The Big Payback and of course, a video wall with a live broadcast of the 144th Kentucky Derby. Put on your Derby best and snap a few party pics on our red-carpet step-and-repeat. Sip on Mint Juleps, Basil Bourbon Lemonades, Kentucky Mules, and beer samples, and nosh on great derby inspired fare. Arrive right on time for plenty of time to play games & purchase your tickets for a 50/50 raffle, ring toss game and pick your pony. Check out the American Road to the Kentucky Derby here. 100% of game and raffle proceeds will sponsor the Music Therapy Program at American Family Children's Hospital. Derby attire is not required, but certainly encouraged as we add a Best Dressed competition to this year’s celebration. So grab your seersucker blazer and best brimmed hat and join us on the infield for Madison’s best derby party! This is a free event open to the public, but new in 2018 a VIP area that requires Non-refundable tickets for $44/person. -- SOLD OUT -- Exclusive VIP Grandstand on The Statehouse Terrace! Limited availability in VIP area; tickets are $44 and non-refundable. Inclement weather plan to be shared in advance of event. For CATCH Members only - Early access to purchasing VIP tickets. Just message CATCH on Facebook and we'll provide you with the code. Sign up for a new member orientation and tour. Get a behind-the-scenes tour of AFCH, learn all about CATCH and connect with other new members. Let Danielle Kamps know if the orientation dates do not work for your schedule. Email catch@supportuw.org or call 608-308-5322. This is one event you'll not want to miss where contributing CATCH members and non-members alike, join together to support the American Family Children's Hospital. Invite your friends, family and neighbors to enjoy a night out downtown Madison to benefit this amazing local cause. Don't forget to dress in your finest black and gold attire! Proceeds from this annual signature event will directly benefit UW Kids Cancer Program at American Family Children's Hospital. A huge thank you to Pieper Power as this year's Gold Sponsor. Special thanks to this year's event sponsors: Baker Tilly, Capitol Bank, Roundhouse Marketing, and Stark Company Realtors. Get your tickets today! Ticket prices: $70 for general admission or $55 for CATCH members with discount code (email sent on September 20th). Why BLACK and GOLD? Gold is the color for the pediatric caner awareness ribbon, Learn more about the UW Kids Cancer program here. Join CATCH on Saturday, September 23rd from 10am - 1pm for our family-friendly fall harvest event. The event will be filled with pumpkin decorating, face painting, corn box, caramel apple stand, mini golf, games and music. Food available for purchase (cash or credit) from The Rodeo Wagon food cart offering delicious food inspired by Oklahoma & Texas. So no need to pack a lunch. Special thanks to Kids Express Learning Center (KELC) located on Prairie View Farm, a picturesque farmette on Madison's west side. Admission for the whole family (all children and parents) included in ticket price. $10 per family or $5 per family for CATCH members. CATCH members, check your email from August 23rd for your discounted ticket code. Is your child an aspiring chef or simply loves to get involved in the kitchen? Join us for a fun, hands-on cooking experience where we'll make a variety of healthy & delicious snacks. This private class is hands-on for parent and child. Held in the Learning Center. Registration is for 1 parent and 1 child, $15 for both. No age restrictions. Parent or guardian must be present during class. Space is limited to the first 20 children of CATCH members only. Registration will open to the general public if tickets remain prior to the event. Get your tickets for a fantastic event at Bishops Bay Country Club! Both CATCH members and non-members welcome, so tell your friends and colleagues. You are invited to join CATCH in celebrating the 142nd running of the Preakness horse race. Come eat hors d'oeuvres, drink Black-eyed Susan cocktails & merrily play race-inspired games while wearing your derby attire. Best-dressed contest with prizes - so ladies don't forget your hats and gentlemen get out your bowties. Tickets are $25 for CATCH members and $35 for general admission. 21+ only. Cash bar. CATCH members receive a free drink ticket for a chalice of Stella Artois beer or our signature drink, the Blush Lily cocktail made with Tito's vodka, cranberry, triple sec & lime juice. Thank you to this year's CATCH Social Sponsors Baker Tilly, Capitol Bank, Roundhouse Marketing, Stark Company Realtors for making this event possible. And thank you to our Preakness Event Sponsors Bishops Bay Country Club, Celebrations Entertainment, ESPN Madison, Madison Area Connectors, Stella Artois, and Tito's Handmade Vodka. Don't miss the first CATCH event of 2017 at Revel! Beat the winter blues by joining us for crafts and cocktails at Revel, a fun and creative space downtown. We will be joined by Dr. Diane Heatley, Medical Director of American Family Children’s Hospital. RSVP your space for $10, which can be applied to your craft or drinks the night of the event. Hurry, space is limited! CATCH hosts a fun carnival day for patients and families including games (like bean bag toss, bags ball, bowling, bucket toss, basketball toss), caricature artist, tattoos, craft station, prizes and snacks/refreshments. Although the event is only open for AFCH patients and families, CATCH members are needed to help volunteer at the carnival. Ladies & gents, mark your calendars for CATCH's 2nd annual signature event. This year, we'll have a live big band, casino tables, prizes and dancing all while sipping signature cocktails & noshing on delicious food. Get dolled up for a night on the town in your best 1920s Gatsby-inspired attire. Both members and non-members welcome, so bring your friends. It pays to be a member including a discounted ticket rate and a FREE signature drink ticket. We have a variety of great sponsorship opportunities available for this event. Please email Danielle if you are interested or for more information, CATCH@supportuw.org. RSVP today & share this event with your friends, family and co-workers! Download a 8.5 x 11 printable PDF poster here. CATCH MEMBERS - We're in need of volunteers to help the event run smoothly. And, great news, FREE admission to the event if you volunteer. Already purchased your tickets, just let us know and we'll provide a ticket refund. CATCH hosts a fun carnival day for patients and families including games (like bean bag toss, bags ball, bowling, bucket toss, basketball toss), caricature artist, tattoos, craft station, prizes and snacks/refreshments. The carnival is located at the American Family Children's Hospital first floor lobby. Although the event is only open for AFCH patients and families, CATCH member volunteers are needed to help run the carnival. Email Danielle at CATCH@uwsupport.org for volunteer signup. Join fellow CATCH members and guests for a fun-filled tailgate at the Wingstop parking lot on the corner of Regent St and Orchard St until kickoff at 11am. Bring the whole family for an afternoon of olympic fun including archery, 50 meter dash, shot put, golf and gymnastics. Kids will also have a chance to design their own medal and make cards for patients at American Family Children's Hospital. Lemonade available for purchase, proceeds benefiting distraction items for Child Life Specialists at AFCH. General Admission tickets are $10 per family. CATCH members are $5 per family with provided code at checkout. VOLUNTEERS NEEDED: Volunteers will receive free admission for their family to the event. Kids welcomed to volunteer with an adult at the Kids Lemonade Stand. The Preakness Stakes is an American flat thoroughbred horse race held on the third Saturday in May each year at Pimlico Race Course in Baltimore, Maryland. And every year, CATCH hosts an exclusive event at the Bishops Bay Country Club full of Black-Eyed Susan signature cocktails, Stella Artois beer, raffle prizes, lawn games, indoor pick your pony bet and more. Race attire a must! The men are handsome in seersucker suits & bow ties while the women look stunning in dresses and extravagant hats. Tickets required for pre-purchase to 21+ only as this event sells out fast every year. Check out our Facebook page for great photos. Tyler's Place is a unique area in the American Family Children's Hospital where siblings can interact with other brothers and sisters while their sibling is in the hospital. It's a supervised area, keeping families close together and helping support siblings by providing therapeutic activities and socialization with other siblings. Parents can then give their full attention to their hospitalized child's care while brothers and sisters participate in structured activities with peers of their own age. It is located on Wisconsin Avenue in the American Family Children's Hospital, room 1425. Every April, CATCH hosts a themed party for Tyler's Place Siblings so that they have a fun day out of the hospital. Although this party is for Tyler's Place Siblings only, CATCH member volunteers needed.